Last week an item came to our attention regarding two wonderful restored heritage surfboats that we need to keep for the ages - please help if able, or suggest who may be able to. We have an immediate problem finding storage for a restored 1947 Towns double ender surfboat and a restored 1971 Clymer surfboat. The property where they were securely stored on the Sydney Northern Beaches has been sold. The 1947 boat is 7.5m long. If displayed on its trailer the overall length is 8.8m and 2.1m wide. The 1971 boat is 8.15m long. If displayed on its trailer the overall length is 9.2m and 2.1m wide. Both are on a trailer so need about 9.5 metres in length. If you can help or have a suggestion please contact Kim Marsh on 0418 248 894 or email ecodirections@bigpond.com. I am also open to suggestions or expressions of interest where both boats may eventually be permanently housed. I hope the double ender will be housed in a museum environment or somewhere similar where it will be accessible for interested people to view. The 1971 Clymer is used occasionally for special events. The 1947 Towns surfboat was originally used by Scotts Head Surf Life Saving Club, near Macksville on the NSW north coast. The boat was purchased new from N. & E. Towns, Boat Builders of Dempsey Island near Newcastle NSW. Local folklore claims the club Sweep collected the boat from Towns and had it named after himself. The club objected and the Sweep consequently left Scotts Head SLSC. As a result the boat was named ‘So Long’. The boat was to be christened by cricket legend Keith Millar who cancelled at the last minute. In his place he sent a young unknown cricketer, Richie Benaud! The boat was used as late as 1962 at a surf carnival at Tathra where it was the only double ended surfboat among the newer designed tuck stern boats. It was applauded as it left the beach signifying the end of an era. The boat was eventually sold to a local Scotts Head minister for use as a fishing boat. In 1982, it was seen by Leanne Marsh, protruding from a farm shed, on a dirt road near Scotts Head. Leanne and Kim Marsh purchased the derelict boat and stored it in Coffs Harbour. It was transported to Sydney, in 1983 for an exhibition at Manly Museum. The boat was stored for many years until the Marshes could afford to finance the restoration. Initially Bill Clymer sourced some Australian cedar planking and commenced replacing some planks. The amazingly adventurous, aging Bill was interrupted early in the process when he damaged his neck in the surf. A damaged neck to ex WWII Z Force commando Bill, equates to a broken neck for average people. His recovery was short lived after a snow skiing mishap in the US at an age when most of his peers were using walking frames. Restoration was eventually restarted when Leanne and Kim Marsh commissioned Glen Myers. Restoration works were based on conservation guidelines following research at the National Maritime Museum Library. The integrity of the boat was maintained by retaining some details in their original state while essential new materials were highlighted. Glen Myers restoring boat. New timbers are purposely highlighted to maintain integrity. Bow box left in original state in restored boat. Boat building craftsman Glen Myers is the son of the late Kevin ‘Bluey’ Myers. The late Bill Clymer of Clymer Surfboats, and the late Les Stewart, Apprentice Master at Garden Island, Sydney, both provided advice on traditional boat building methods which aided authenticity of the restoration. In 2007, Leanne & Kim Marsh lent the boat to Surf Life Saving Australia to be displayed as a major attraction in the SLSA ‘Between the Flags – 100 Years of Surf Life Saving’ exhibition at the National Museum, Canberra, and later the National Maritime Museum, Sydney. On 4 October, 2013 the double ender had an enjoyable day at the Sydney Opera House representing the Australian Surf Rowers League at the SALUTE TO NAVY event, celebrating 100 years since the first entry of the Royal Australian Navy’s Fleet into Sydney 1913 – 2013 and the International Fleet Review. Sharing its sleek lines with Utzon’s Opera House sails. A highlight of the double ender’s visit to the Opera House was meeting John Books and his daughter. John worked at Garden Island with Les Stewart who advised us on traditional boat building methods prior to restoration but unfortunately never saw the completed project. The restoration works received John’s learned approval. In retirement John assisted with Sydney Heritage Fleet projects. The surfboat was built by Bill Clymer Surfboats in 1971 for Point Lonsdale SLSC in Victoria. It was named as one of their ‘Steam Packet’ boats. Leanne Marsh’s brother Ron Michie worked on the boat while apprenticed to Bill Clymer. Venus Bay SLSC acquired the boat from Point Lonsdale. It fell into disrepair and was bought by well known Jan Juc SLSC surfboat sweep Scott Tanahill who later sold it to Leanne and Kim Marsh. The boat was manufactured by the cold moulded process. The silver ash keel, stem, stringers and ribs were laid on a mould (frame). Three layers of cedar planks, 1/8 inch (3mm) thick by 4 inches (100mm) wide were laid up over the framing. The outer and inner layer, in diagonally opposite directions, and central layer perpendicular to the keel. Glue was used between the layers with thousands of staples temporarily holding the planks in place. The staples had to be painstakingly removed by a small hand tool. The bow and tuck (rear) decking were timber lined. The 1971 Point Lonsdale boat had a stylised marquetry of the Point Lonsdale lighthouse and rocks inlaid on the bow. This detail had deteriorated beyond repair but enough was evident to take a template and create a new timber inlay on the replaced bow decking. The boat was restored in 2012 by Glen Myers of GM Boat Building. It was in reasonably sound condition structurally. It was decided to restore it to a seaworthy state capable of being once again used in the surf. The integrity of the boat was maintained with only a few items needing to be replaced. These were highlighted rather than blended to ensure the original boat is identifiable. 1971 Clymer surfboat being restored in 2012. The 1971 Clymer boat has currently put to sea through the surf three times since being restored. On all occasions it was rowed by a crew of over 60 year olds including Les Watt, John Swan, Colin Scully, Kim Marsh and Ken Bucknall – each multiple Australian Surfboat Championship winners. Its first outing was to accompany a new surfboat christened the Kim ‘Clark’ Marsh at Freshwater Beach. The second was to scatter the ashes of former crewmate Christopher ‘The Bat’ Branson. Both times the boat was hit by large waves on the way to sea but punched through beautifully. The boat refused to return to the beach peacefully on its first two outings and selected waves that did it proud. Restored boat’s first outing …. and loving it! First wave after expensive restoration! Nathan Perry builder of modern surfboats shows his sweeping talent extends to wooden surfboats from his apprenticeship days. Nice of the ‘James Craig’ to pose in the background! 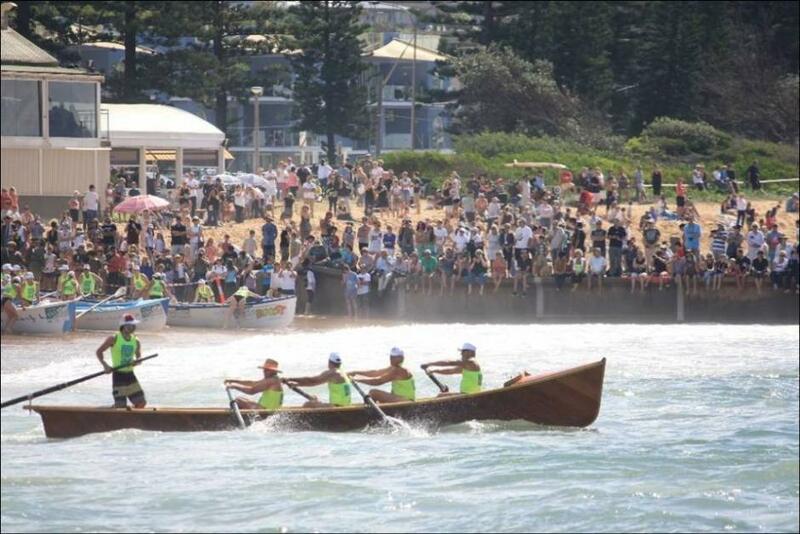 The boat’s third outing was the 100 year ANZAC commemoration held at Collaroy Beach. It was the only heritage wooden surfboat amongst 100 modern surfboats. Story and Pictures by Kim Marsh, 2016.